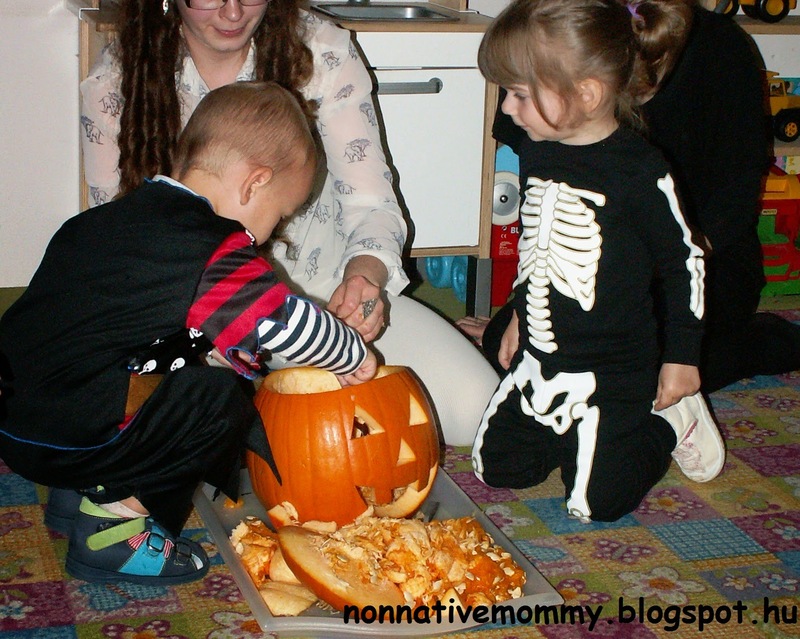 Our preparation for Halloween started more than a month ago with the skeleton craze (see a post about it). E. has really been excited about this holiday. She didn’t get the spooky part. 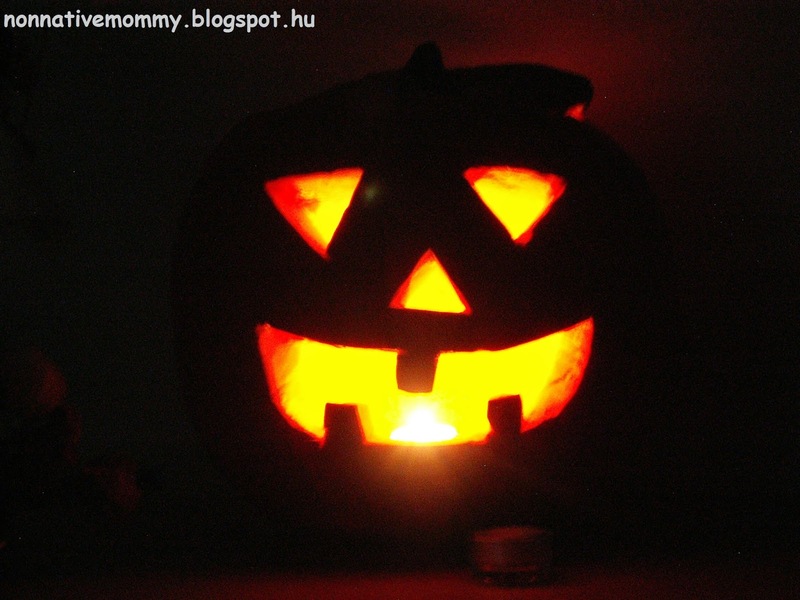 She thought ghosts, skeletons and witches are funny and fell in love with the jack-o-lantern. 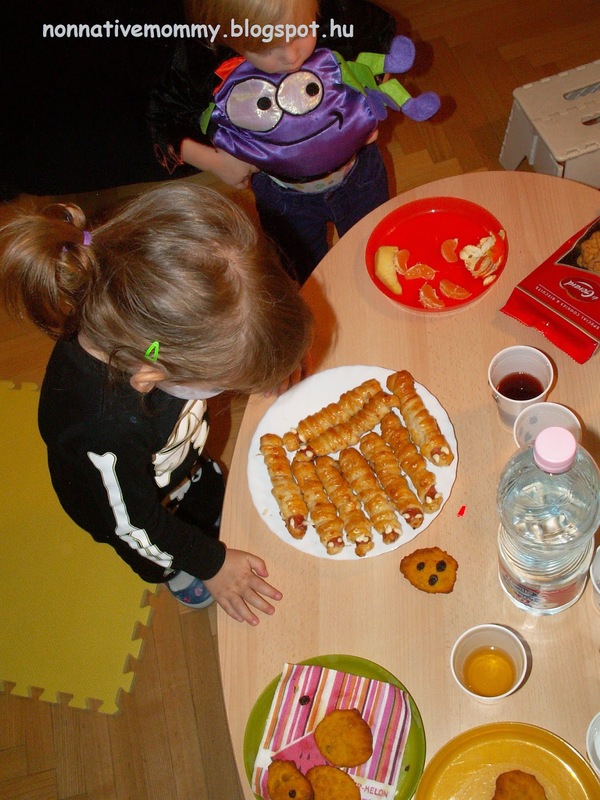 We, parents, did a lot of preparation for the big day, which was the 30th instead of the 31st October. 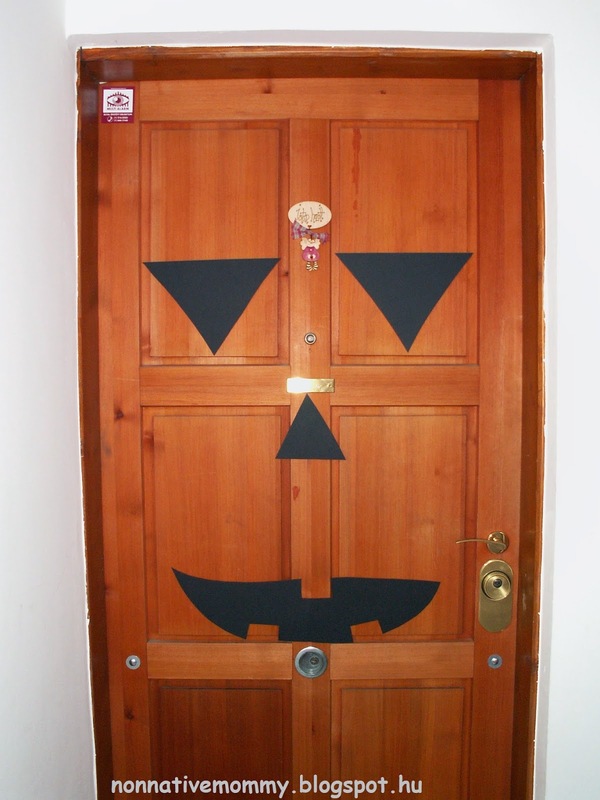 Knock, knock trick or treat who are you? 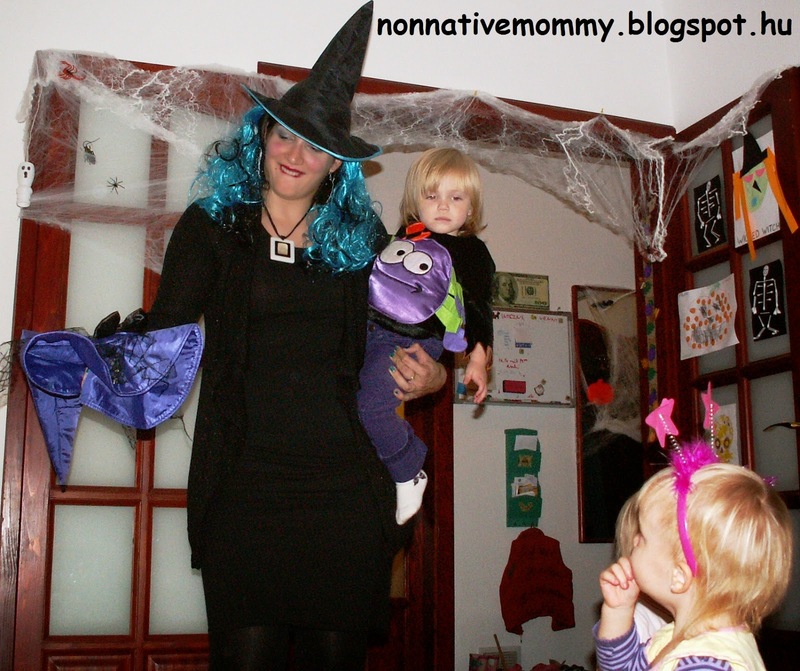 E. knew exactly what she wanted to dress up as from the very beginning. What else than a skeleton. 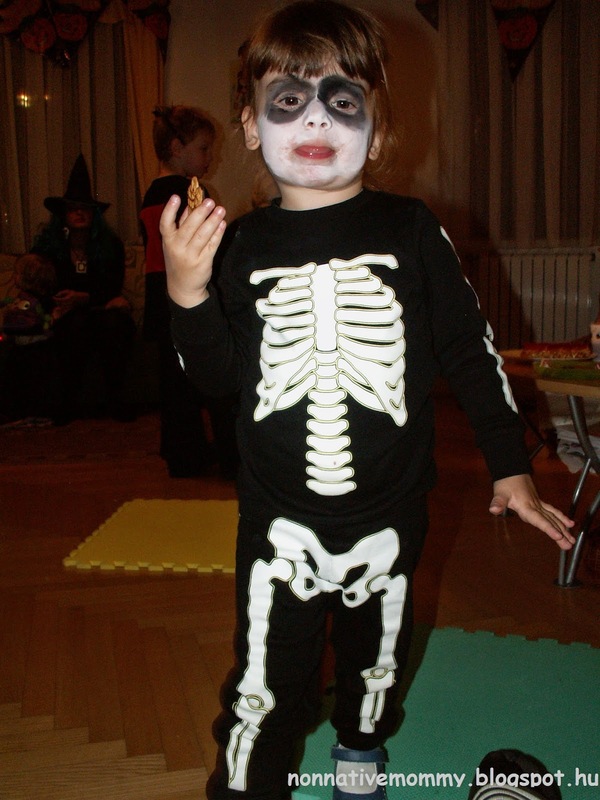 (I got her skeleton costume -pyjamas- from H&M). 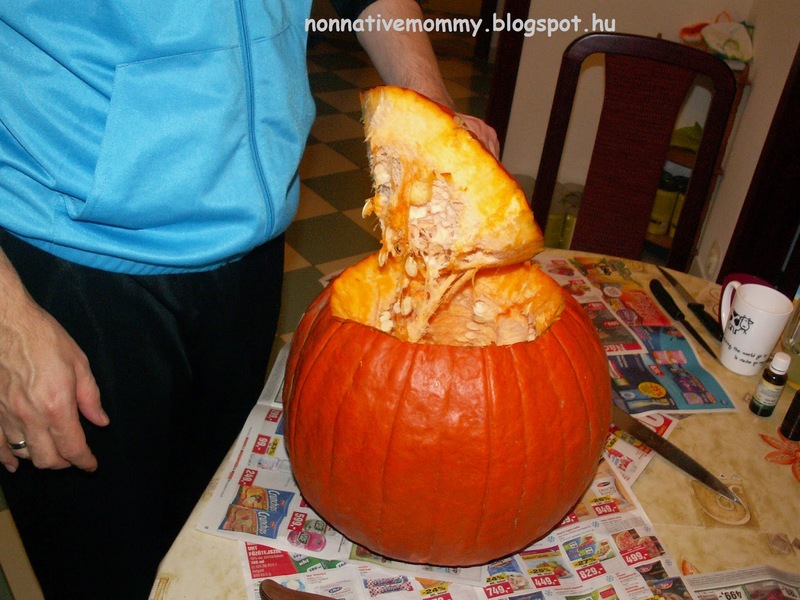 As a part of the party the kids could have a look at how a pumpkin is carved into a jack-o-lantern. 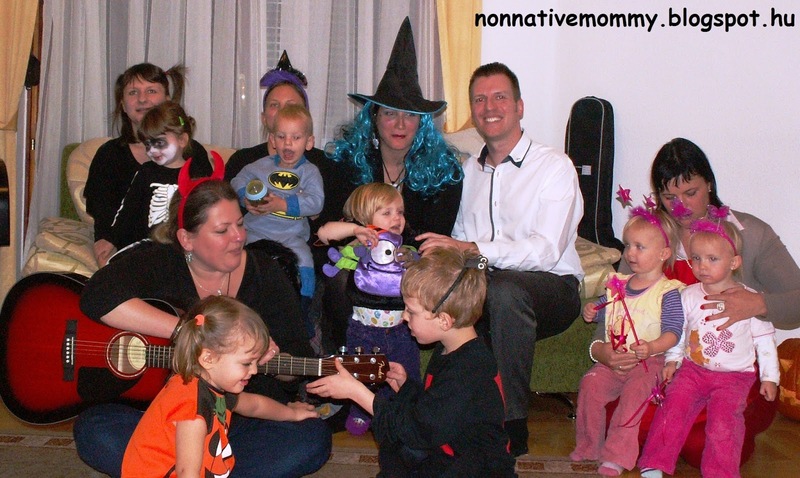 … and the MEC (Mums’ English Club) Halloween party. 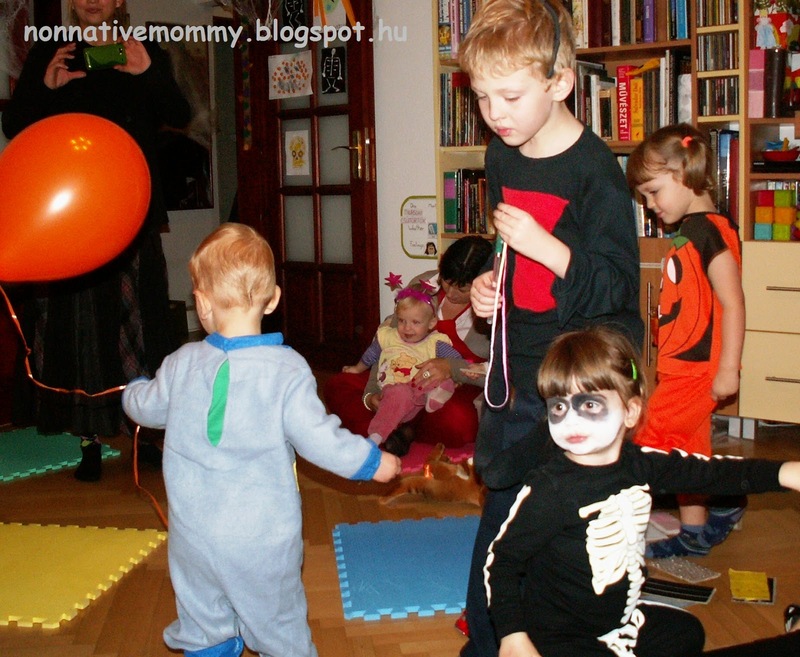 Batman is playing with the balloon, Pumpkin and Spider are looking for some toys, Fairy wants her Mommy in the backround and Skeleton is just gazing into air. 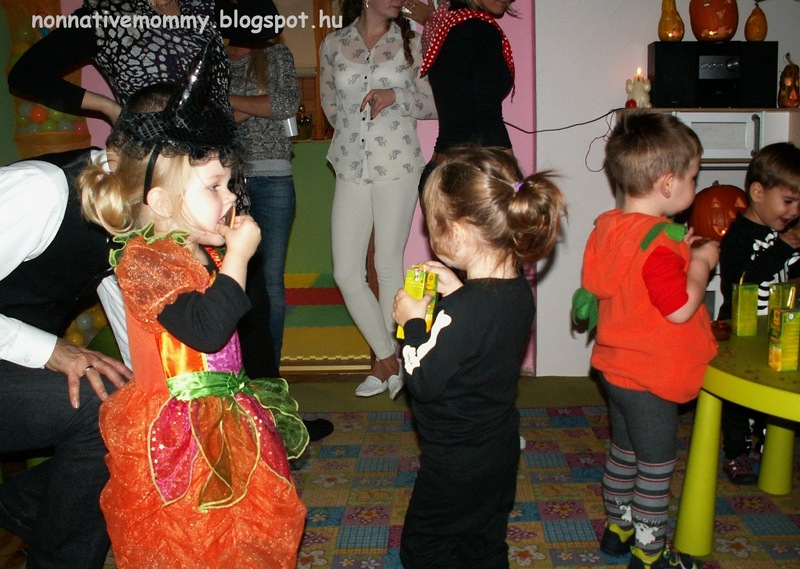 The parties, the excitement, the food, the costumes, the decorations and the atmosphere were all great and memorable for both parents and their little ones. See you next year! Putting aside my scepticism, few weeks ago we took part in a mock lesson at the Helen Doron school nearby. The teacher, Zs., was really kind, gave us all the information we needed (about the course booklets, CDs, prices, summer programmes, the course itself). She was well-prepared for the lesson (even had a little piece of paper with the lesson plan, CD track numbers etc., which E. wanted to steal). She’s got a relatively strong Hungarian accent. I would be happier with a native speaker, but you can’t have it all. So we went home cheerfully. I discussed the details with D. and we decided to go for it. The course has just started we are at the very beginning. It’s hard to draw any conclusion, but so far so good. We are enjoying it. I found the CD material quite entertaining, nicely put together and only about 10 minutes long. According to the instructions, E. needs to listen to it twice a day. We manage to do that. We have a long list of songs she listens to while I’m doing housework, so I included the Helen Doron tracks into our morning routine. The school premises are basic, though. The classrooms are okay, they are well-equipped. Still, I think the flashcard, pictures should be re-laminated every now and then. The prices are reasonable. If we do not calculate the booklets and CDs, on a monthly basis it costs as if you were going to a costly playhouse once or twice a week. Of course, hiring a native nanny at the same fee would be the best, but I want E. to be in another surroundings, meeting other people, kids. In the back of my mind it is also there that some moms might be interested in MEC. I’ll give them a flyer soon. I’ll be back posting on Helen Doron Early English more, when I have more to talk about. To reach our goals I am not enough as the only English speaker in E.’s life. Another helper of ours is A., our British nanny. A. comes once a week (on Thursdays) for 2 hours to play with E. She loves A., smiles at her as soon as she arrives, screams and babbles a lot while A. is at our place. I may claim that E. “talks” to A. the most compared to how rarely they meet. A.’s main task is to talk, talk and talk to E. Another reason why it is so useful for her to be present in our life is that I can brush up my English. If I don’t know the exact, or natural expression for some object, activites, baby language, A. is here to help me out. In the future I would like A. to come more frequently or come out with us to the playground or to the zoo. If I go back to work (which will be soon even if it’ll be only part-time) I would be happier if an English speaker took care of E. while I’m away. 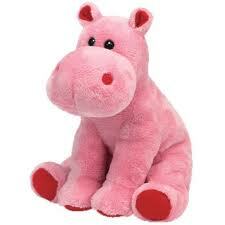 If she has time for us as she is quite popular with moms. A. could be a kind of replacement for me. I know this idea won’t be very welcomed by the Grandmas. At the Helen Doron Early English class, our teacher, Zs., is also a kind of helper. She provides us with another occasion to practise and learn English out of our home. E. can see that other people also use this form of communication. And it is also important that she is with other kids, too. 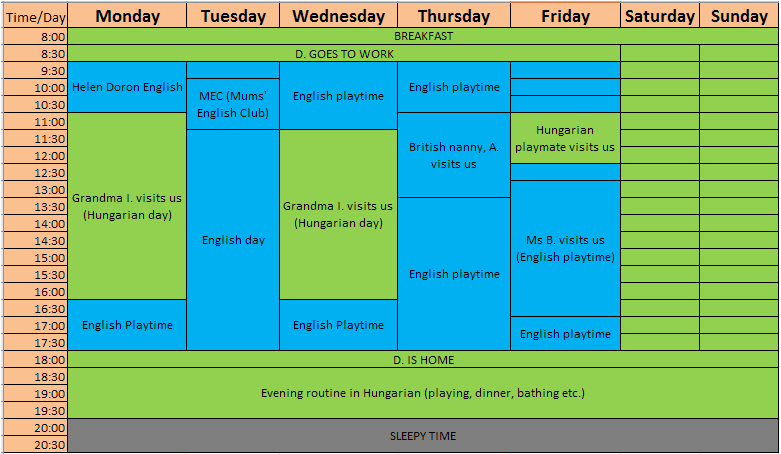 The same applies to MEC (Mums’ English Club), except for the fact that it takes place in our home, in E.’s comfort zone. My plan for the near future (as soon as E. can walk) is to find a playhouse where native or non-Hungarian mommies go with their little one. Fridays are changeable, but in general half of the day goes in Hungarian, the other half in English. Before our Hungarian playmate comes to visit us, we go out for a walk together or to the market and then we use Hungarian as English would be unnatural. My only problem is the weekends. As the whole family is together, it’s really difficult to find time and natural situations when we can use English. 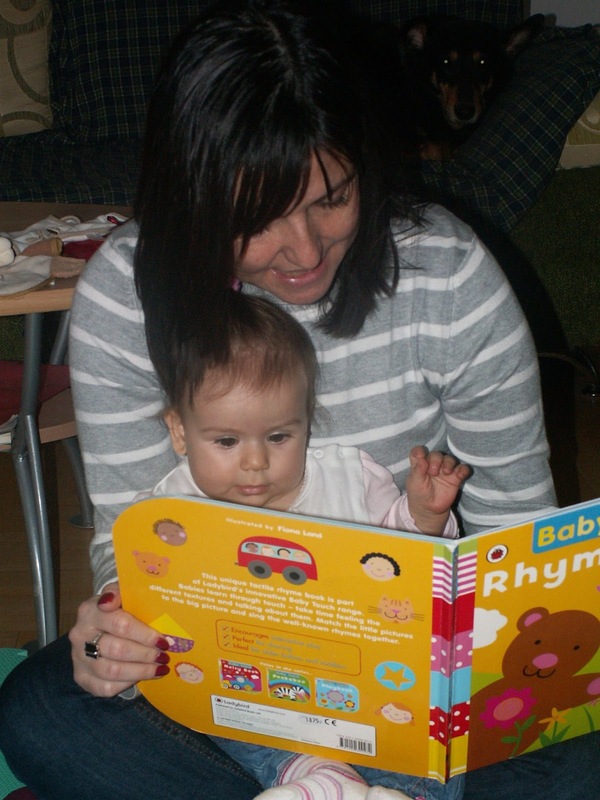 At weekends 1 hour of English per day is “forced” into our programme (singing, video watching, reading out) but not real communicative interactions. I’ll try to find out something for the weekends. If you have any suggestions, just feel free to share it with me. In the table above you can’t see food time (which is in the given language according to which day it is) and daily sleeping time, however the latter takes away 2-3 hours per day. At the beginning of January we took up baby swimming on Saturday mornings. 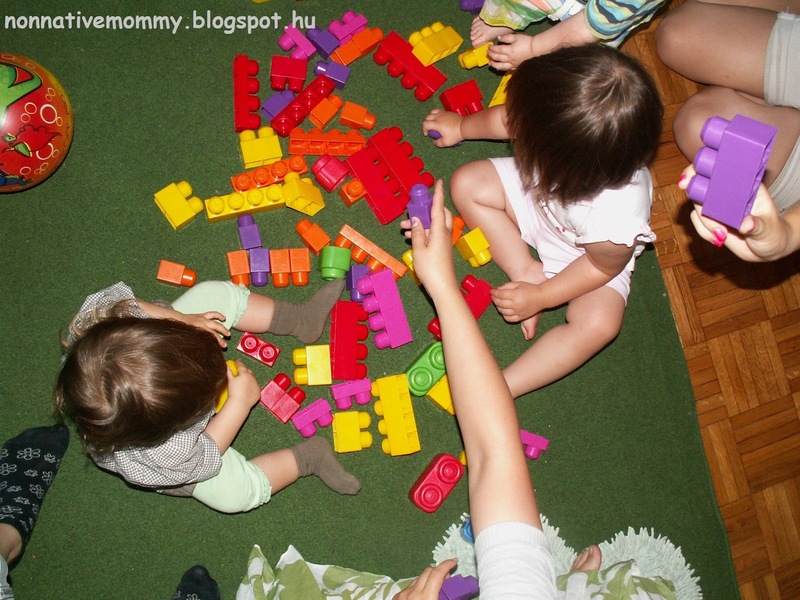 I found a course at Budapest Moms (you can find the group’s facebook page here), which was held in two languages. The tutor is Hungarian and in the water one of the moms do the interpreting. As the swimming pool echoes a lot it is hard to hear the Hungarian words, not to mention the English ones, however, we met a lot of non-Hungarian families (Russians, French, Dutch, Canadians etc). As for the English language, it doesn’t make a big difference whether we take part in this swimming course or another, but the trainer is really professional and the pool is clean, the water is warm. So all in all we, and most important of all, E. enjoy it. It’s a good family programme for the weekend. The course is finished in a week, now we are thinking of continuing it, but not sure. Good weather has arrived, we might want to spend time outside instead. I’m a little worried about being able to keep this schedule. One thing is permanent in a baby’s life that nothing is permanent. As I’m planning to work part-time soon, probably in a month or two our agenda needs to be revised.